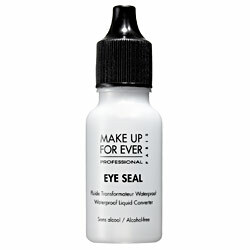 Eye Seal has been designed to waterproof all powdery make-up and pencils. It intensifies make-up colors and pearl effects. Its alcohol-free formula does not irritate the skin and can be applied close to the eye. I picked up one of these little babies a while back. While it is small a little goes a long way. The instructions on the box say to put it over power shadow to seal it in. Unfortunately for me I only seem to mess up my liner when doing this. Fortunately I realized mixing loose shadows, piments and minerals with it works amazingly well to create a crazy waterproof line. I've also tried wetting my brush with the eye seal and then putting it into shadow and got the same amazing results. I've even mixed liquid liner with it and seen great things. This makes makeup stay put! All day! Even in the humid summer! Really!!! Really! I don't think I could live without this stuff anymore. The bottle is little but one drop per eye is all you need so it will last you months and months. I was told at a MUFE seminar that you can put it on top of any product to make it waterproof, even mascara. I have yet to try this, but I am going to take their word for it. If I say something is waterproof I mean it. If I can put something on in the AM on a work day and it is even slightly there at the end of it then it is good. If it looks like it did first thing in the morning at the end of the day then it is amazing. This is amazing. If you are a fan of anything in the aqua line from Makeup Forever you are going to love this beyond belief. If you want something that really works, give this a shot. I used my hand as a quick palette one day to mix eye seal and my Hard Candy Walk the Line liquid liner. It stayed on my hand for 3 days. I washed about 15 dogs the first day and my hands about 100 times. I was shocked that it was still there all those days later.